In my eyes this outfit is perfect. The most comfortable pair of white skinnies (seriously so soft and lightweight without being see-through! ), a bright eye-catching tank, colorful jewelry, and wedges. Throw it all on, throw the hair in a pony, grab your sunnies and you're out the door looking chic and ready to take on the day. 1 - I am a morning person. I love getting up early (like 5:00/5:30) while everyone is still sound asleep, working out (sometimes! hehe), turning on CNN, and drinking my coffee while I get ready for the day and work on the laptop in peace and quiet. I look forward to that time each day. Then I'm ready for the hustle and bustle of fun that comes with 3 kids! 2 - I had been on the hunt for the perfect pair of non-distressed white skinnies for quite some time. My husband is not a big fan of all the distressed styles lately. So I thought I'd find a "regular" pair. These jeans in todays post are fabulous and under $55! 3 - Our oldest goes to camp next week for 4 nights! I'm excited for her and all the fun she'll have with her friends. But having her gone for that long without talking to her will be strange. 4 - My husband and I sat outside last night and enjoyed a bottle of wine by the fire. It went too fast! Why do they only make 750 ml bottles or a magnum size (which is too big for two people)? Trust me - it won't go to waste if we open a second bottle but an in-between bottle size would be perfect! Your outfit is beautiful, I love the ruffled back and your necklace. I'm a morning person too mostly and I couldn't agree more about the wine!! Beautiful! 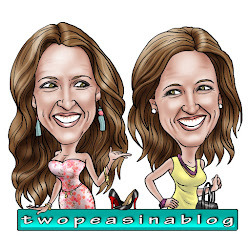 Hope you'll stop by my blog for the latest post! What a gorgeous outfit, lady! I love that top! Have a great day! Thanks for your comment on my blog, you're a no reply commentator so I couldn't respond in email. Thanks! Hmmm. Didn't mean to be a no-reply. Did I click that by accident? I'll have to change that if so! Lovely Summer outfit - the necklace is a scene stealer! Thanks! I'm obsessed with neon yellow lately! Thanks! The T-back shows just enough skin to add a little sassiness. So light and airy. I love your outfit what a perfect summery outfit! I can only wish that I was as dedicated as you are to getting up that early. Most days I can barely peel myself out of bed for work. I should start getting up that early, I could more work outs in then. I really just love everything about this outfit. The color of that blouse is so pretty with the vibrant necklace and the white skinnies. This is such a fresh and airy look! 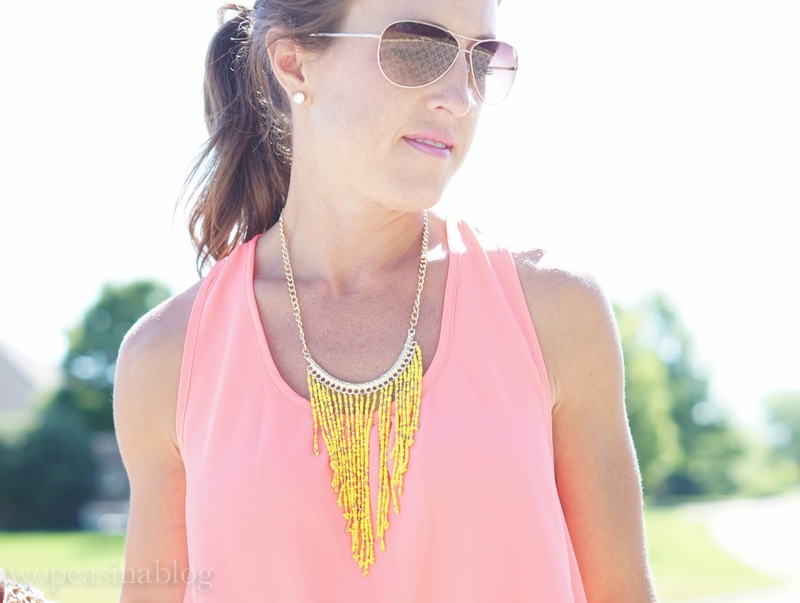 I love your coral top and yellow necklace! cute outfit for summer! I love those wedges! Oh I love this!! The coral and yellow paired with the white jeans is gorgeous! Oh man a glass of wine by the fire sounds perfect! We love sitting out by the fire! So relaxing and a great way to catch-up. love a good, simple pair of white jeans! that coral looks stunning again it. I feel ya on the wine! I'd so love an inbetween sized bottle!! Thanks! Yes! Love white skinnies and wear them A LOT! hehe They just go with everything. The back of that top is PRECIOUS! Also, sleep-away camp is so much fun, she'll have a blast! I love that ruffled top, the color is just perfect! haha "a bottle of wine goes so fast". Aint that the truth!! I am the opposite of a morning person!! How old are your kids? Love the look!! Our kids are 10, 9, and 3. It's definitely busy around here! ooooh, I love this ruffled tank! The back detail is a fresh surprise! This outfit is perfect! I know you said in your eyes, but seriously! I love that tank top! Also I am a semi morning person, I can easily wake up in the morning and I love being awake when everyone else is still sleeping, but I honestly am so grouchy. Its something I really want to work on! I love the ruffles in the back and that your paired this light pink top with this fringe necklace! I'm a morning person too. This morning I was up at 5:45 this morning to join my husband for a fun run that his unit does every month. It feels great getting up that early and it makes your day feel much longer. Awesome! I love getting the workout in early. And you are right - the day does feel so much longer! I so wish I could be a morning person! I would love to be able to get up and get things done like you! Thanks so much Amanda! So glad you stopped to visit! Lovely outfit. Both for the ruffled back and the contrast between the yellow of the necklace and the coral of the top. I'm a morning person too and if I don't get my hour of quiet early on, I can be quite grumpy. And my husband isn't a huge fan of distressed either hahah. Such a pretty outfit, I love the ruffle details on your top!! You look amazing. Thanks! Neon yellow is a favorite of mine this summer. Cute look! The back of that tank is so fun! And I love the coral and yellow color combo. Pretty for the summer! not only is this outfit adorable but omg at the detailon the back! swooning over here!